It is advisable for you to buy chicken feed pellet mill to turn agricultural wastes or wood residues into wood pellets for heating and cooking or make your own feed pellets for animals, if you have a large quantity of wood residues; or you own a large farm and having many agricultural wastes to dispose of; or you are a farmer who breeds animals, such as chicken, ducks, sheep, cattle or pigs, etc,this poultry feed pellet mill can is of special poultry feed pellet mill design with a running die mould and stationary rollers. The advantages of this design is low electricity consumption and efficient in making feed pellets. This portable poultry feed pellet mill can process corn, bean dregs, straw, grass and rice hull powder into granulated pellets. You just put the chicken feed pellet mill on the flat ground and then put the feedstock into feeding mouth, then the material will be pressed into the die hole by the friction between die mould and rollers. Usually the gap between die and rollers is 0.1-0.3mm for making feed pellets. The feed pellet length can be adjusted by the cutting knife. You can replace flat die to making feed pellets with different diameters of die holes. After the pellet die has been used for a period, you can turn oven it and continue to work. This poultry feed pellet machine can be used to make feed pellets, fuel pellets and animal bedding pellets at home, on farm or in small pellet plants. 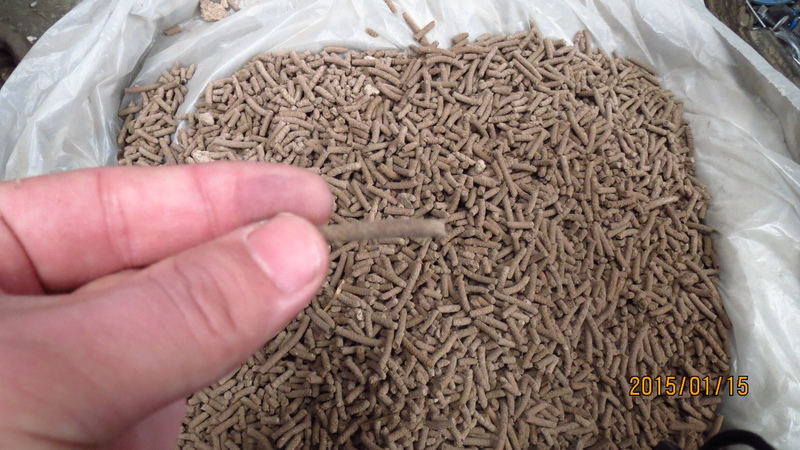 As the picture shows, fuel pellets can be used for home cooking and heating; feed pellets are for animal feeding. What to Do Before Starting Chicken Feed Pellet Mill? 1. 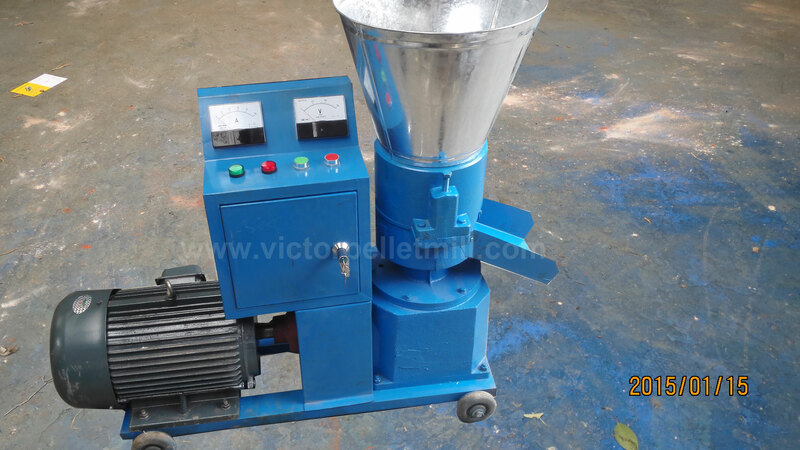 Place the chicken feed pellet machine at a safe and dry place. 2. Do not operate the pellet mill at a temperature of below 10 degree celsius. 3. Make sure all bolts and nuts are securely tightened before operation. Before starting producing pellets, it is important to polish the die to make it smooth. To do this, you need to prepare 5kg flour, 5kg fine sand and 1.5 liter vegetable oil, and then mix the ingredients into a bucket. Next, start the pellet machine, and then put a proper amount of mixed materials into the poultry feed pellet mill and let them run through the die hole. You should do this repeatedly for 40-60 minutes. C. Before first run, adopt grease to lubricate all bearings. The operator needs to do this once at lease every 10 hours. D. Set the pressure for the roller wheels. To do this, just drag the die and find whether it can rotate under the rollers. The gap between rollers and die should be controlled within 0.1-0.3mm.